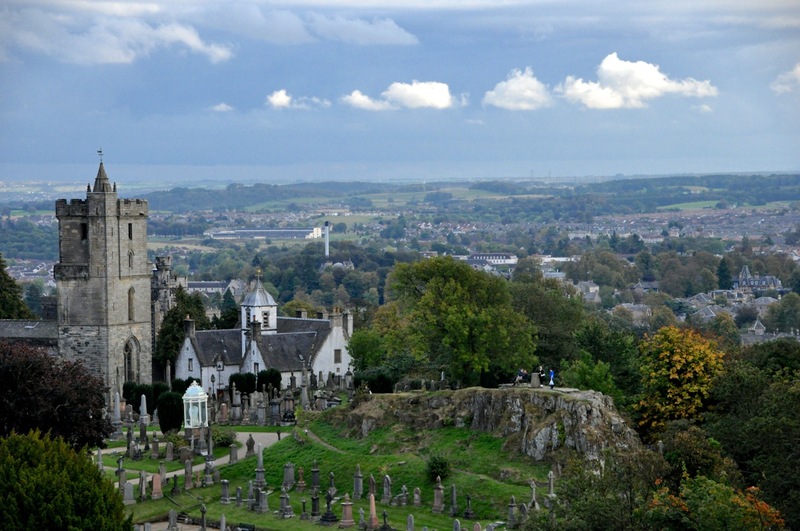 Stirling – and Stirling Castle in particular – practically IS Scottish history. Located at the farthest downstream crossing of the River Forth, Stirling was the gateway between the Highlands and the Lowlands. Guarded by the impregnable Stirling Castle, its strategic importance brought it traffic, wealth, … and invaders. It became the Scottish capital and the royal stronghold of kings, and the city prospered. Although Stirling the city has always been secondary to its Castle, it’s a quaint city with a fair amount of its own attractions. To show you both the city and its Castle in one post would be too much; we’ll do the city first. brick, and many look old. Some really are, but let’s start with some ruins – Mar’s Wark. Stirling has quite a history going back to the 1100’s, but it’s glory days were the 1500’s – 1600’s with the royal Stewart court (we’ll cover history in the next post on Stirling Castle). 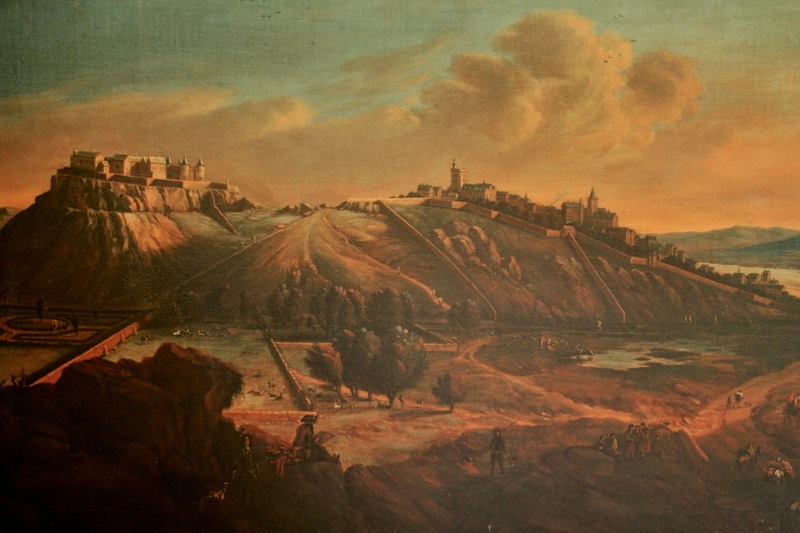 James Erskine, Earl of Mar, became keeper of Stirling Castle and regent to King James VI. To proclaim his status, in 1567 he built a grand, richly decorated mansion on the processional route up to the castle, including the display of the royal arms above the door. 150 years later the mansion was damaged by cannon fire during the (unsuccessful) Jacobite Rising led by the Bonnie Prince Charles, and the building was abandoned. plans were made to convert the mansion into a poor house, but in 1666 it was bought by the 9th Earl of Argyll, who remodeled the house in the 1670’s. Unfortunately our new Earl was beheaded for treason in 1685 (didn’t choose sides well), but the house remained in the family ownership for more than a century. It subsequently became a military hospital and a youth hostel, but was renovated by Historic Scotland back to its time in the 1680’s. As shown below, it’s impressive. was converted to a bake house after the new kitchen was built in the late 1500’s – the new kitchen complete with slop basin to the outside and a recess where salt was stored to keep it from becoming damp (this is drizzly Scotland, remember). the walls. Very clever! The room’s fireplace is from 1630 and was once richly painted. fireplace still shows traces of the painted arms of the 1st Earl of Stirling. extremely expensive in these times; the great canopied bed was likely the most expensive item of furniture in the house. Notice the en suite bathroom with boxed chamber pot and lid. Pretty fancy, huh! 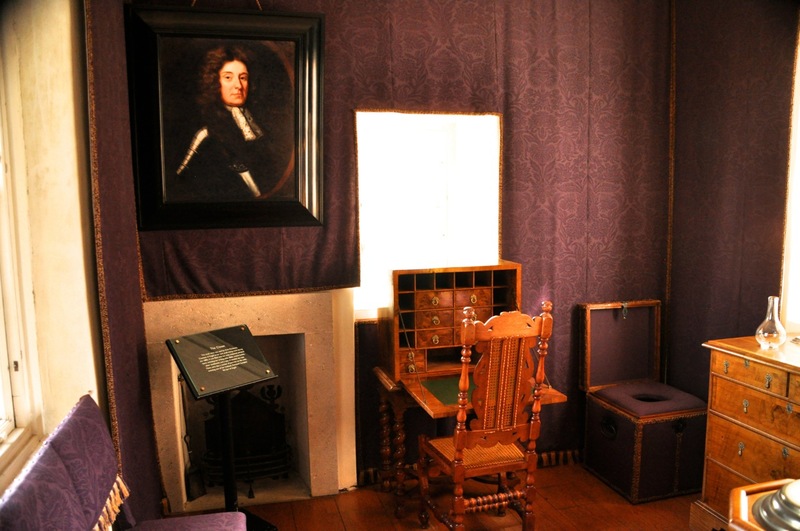 The so-called Closet is a small room used by the Countess as her own small sitting room. It was filled with her most treasured personal items, including her writing table, Bible, crystal bottles, silver candlesticks, a case of wooden tea cups, and (of course) a portrait of her ill-fated husband, the 9th Earl of Argyll. 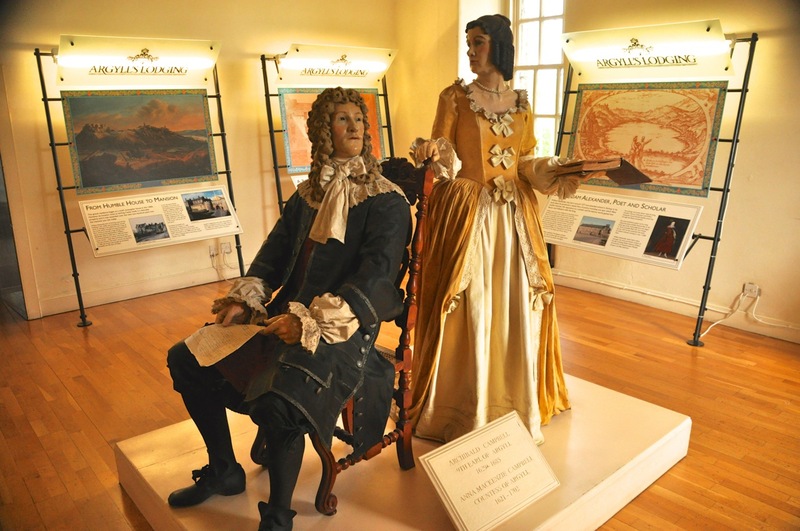 We’ll leave Argyll’s Lodging with a picture of the 9th Earl and his Countess, in the dress of their times. The last area we’ll visit is the Church of the Holy Rude (and adjacent hospital). This is the medieval parish church of Stirling; “rude” is a medieval word for the cross of the Crucifixion. The Church of the Holy Rude is the oldest building in Stirling, after the Castle. Mary Queen of Scots worshiped here, the famous preacher John Knox preached here (we’ll visit him in a future post), royal baptisms occurred here, and the infant King James VI (later James I of England) was crowned here, making this church and Westminster Abbey (London) the only still-in-use churches to witness a coronation. wonderful – massive and graceful at the same time. The medieval roof is convincingly medieval. The church contains some fabulous stained glass windows, mainly from the late 1800’s. We’ll show you a window with some close-ups. In that 2nd picture above, Christ’s body (returning from the grave) is transparent! Cool touch, eh? We’ll share a few more snippets. endowed by John Cowane, whose statue is there in the tower. Today it’s a coffee shop/pub. Wow! Sorry about the long post! Hope it was somewhat entertaining? Next post – Stirling Castle: home of battles, refuge of kings and queens. This entry was posted in Lowlands, Scotland, The City of Stirling, home of Stirling Castle. Loved the tour and history lessons! Thanks.